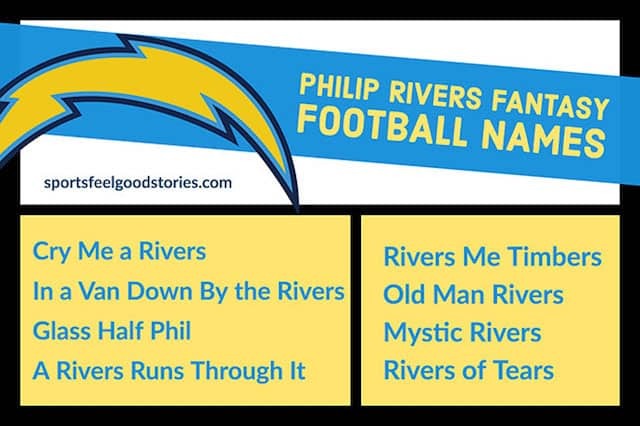 Philip Rivers fantasy team names are great options if you land the Chargers QB for your team. The wily veteran of the NFL has seen his team succeed and fail over 15 seasons—and even manage a move to Los Angeles—but he always seems to keep his team in contention. Before he is finished, Rivers will end up among the top passers in NFL history, with a top-ten best career passer rating. He may also take the lead for the most ever consecutive starts by a quarterback before he wraps up his career. A Rivers Runs Through It. Draft day 2004 arrived with plenty of drama. Eli Manning was projected to be drafted by the San Diego Chargers in the first round, but he said he would not sign if drafted by the team. So the Chargers selected Manning and then traded him to the New York Giants for Rivers and additional draft picks. Rivers currently has eight children: six daughters and two sons. He has stated that he would like to add to that number. Rivers wears the number 17 as a tribute to his father, who wore the same number during his high school football career. He holds current NFL records for Single Game Completion percentage (96.55%), Single Game consecutive completions (25), completion percentage with 400+ yards passing, touchdowns to a tight end (85) and consecutive games with a passer rating above 120 (5). Over The Rivers & Through The Gates To Gordon’s House We Go. When I Go, I Philip Rivers. In a Van Down By the Rivers. 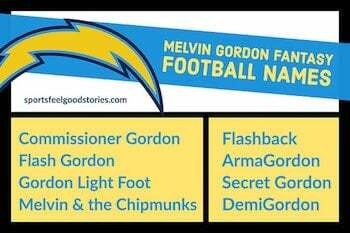 Click on image above for more Chargers fantasy names. Rivers played football for the Athens High School in Athens, Alabama, where his father was the head football coach. He became the best prep quarterback in the state, receiving offers to play at Auburn, Alabama and North Carolina State. Rivers chose NC State and started his first game in 2000. During his college career, Rivers broke nearly every NC State and ACC passing record. He finished his career with 13,484 passing yards and 95 touchdowns. His number was retired at the end of his senior year at North Carolina State. Felipe Rios and the Bolo Boys. You’re on Philip Rivers Fantasy Team Names.